Driving around County Kildare I have noticed a small number of amateur protest signs erected by an organisation called the KTCA or the Kildare turf cutters association. 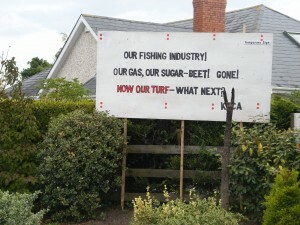 If we didn’t have enough problems to sort out in the Country at the moment, the KTCA are protesting against the recent Government ban on cutting turf in specific locations. 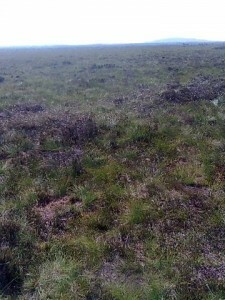 The ban is an attempt to protect the last remaining raised bogs, located in the East of the Country, as opposed to the more common blanket bogs which are present in the West of Ireland. There are currently negotiations taking place to compensate the turf cutters because of the ban, but no final deal has been agreed yet. Time is of the essence as the Irish Government will be subjected to daily fines by the EU if it continues to allow turf cutting in these most sensitive environmental areas. Ireland’s raised bogs are the only examples remaining in Western Europe and there is now less than 1% of the original area left in Ireland in good condition. The KTCA want to defend their ‘right’ to destroy the final 1%, as they have rights to harvest turf from these bogs going back to the 19th century. They use the turf to heat their homes. Raised bogs provide a better standard of turf than that from blanket bogs. The Governments ban on cutting turf in certain areas is not an example of taking peoples rights away; rather it is a responsible position to adopt considering the small amount of pristine raised bog remaining. Surely we want to retain our remaining raised bogs for their biodiversity, but also for future generations to appreciate and visit. The cutting of turf in Ireland even on a small scale now causes much more serious damage to the bogs then before because modern heavy machinery is used. The damage is caused not so much by the actual cutting and removal of turf, which in some cases can be over a relatively small area, but because the bog is drained to allow the heavy machinery and trailers in to strip the vegetation cover, cut the turf and then cart it away once dry. 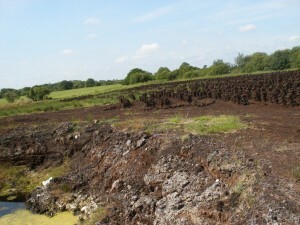 See photographs below of a typical raised bog and then one that has been drained to allow cutting to commence with the cut turf stacked to allow it to dry. It’s pretty obvious you have no idea about the issue you are commenting on. It is not the preservation of peatlands that is the problem; it is the Irish government’s interpretation and implementation that is causing all the problems. Are you aware that Bord na Mona take out 4 million tonnes of peat each year for briquettes, peat moss and fuel for power stations? Are you aware a new peat-fired power station was opened in 2004? Are you aware the average turf cutter uncovers about 2×6 metres of foliage each year? Mechanised domestic turf cutting does not damage the surface of the bog – the machines only operate on the cutover and are on wide tracks. Are you aware that the intention of the EU Habitats Directive was to stop commercial turf cutting and peat milling? This statement is straight from senior people in DG Environment in Brussels. Are you aware Heritage didn’t even follow their own rules, for SAC designation, as laid down in SI 94/1997? Educate yourself and then comment on the issue in a critical way. @Polly, the purpose of the EU Habitats Directive is not to shut down any specific industry, but to protect and where possible restore certain habitats and species that are now rare in Europe and/or internationally important. Bord na mona destroyed most of their bogs before the directive came into effect, and those that remained were sold to the state. Domestic turf cutting does not always operate on the cutover areas- take a look at time lapse imagery on Google Earth, and you’ll see many of the bogs being chipped away.